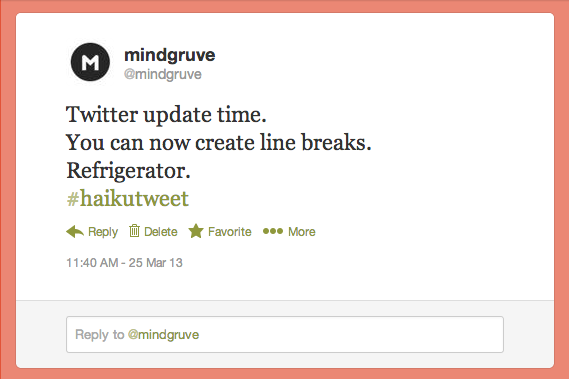 Recently, Twitter announced that it now supports line breaks on Twitter.com and through their official mobile app. As long as you’re within their 140-character limit, the possibilities are endless. So to honor this moment, I decided to create a haiku for this update. As fun as that was to craft that haiku, I can see this feature being abused. With no regulations on how many characters need to be on each line, these tweets can expand to almost 140 lines! Imagine how distracting that tweet can be on your feed (a plus for marketers?). Have you built your own haiku tweet? Share your creative tweetery by tweeting it to us on Twitter. *Author note: The last line of the haiku is referring to this awesome threadless tee. And I’ve always wanted to complete a haiku with the word, “refrigerator.” Checking that off my copywriting bucket list.